Alter Bridge frontman Myles Kennedy was among only a handful of singers given the chance to audition as Robert Plant's replacement in Led Zeppelin, or whatever incarnation of that band would follow. Unfortunately, or fortunately (whichever way you like to look at it) MusicRadar's exclusive interview with Jimmy Page's manager Peter Mensch laid rest to any chance of Led Zep reunion. But that didn't stop Myles Kennedy being extremely "grateful" for the experience. "I am not singing in Led Zeppelin or any offshoot of Led Zeppelin, but I did have a great opportunity and it was something that I'm very grateful for. 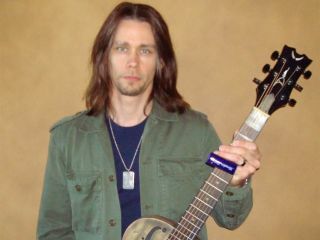 But Alter Bridge will go on, and that's that," Kennedy told the Eric Blair Show while at NAMM. When questioned about the rehearsal setlist, Kennedy was secretive: "I'll tell that story some day. But for now, it was a good experience, and I'm still pinching myself, let's put it that way." With a Led Zeppelin reunion well and truly buried and Myles Kennedy focussing hard on Alter Bridge, it doesn't leave much room for the rumoured reunion of the 'Bridge's guitarist Mark Tremonti's former band Creed. A great disappointment or another blessing in disguise, again depending on which way you look at it.